Amethi, January 23: Priyanka Gandhi Vadra has been appointed as Congress General Secretary for Eastern Uttar Pradesh. Senior Congress leader Ghulam Nabi Azad, who was holding the position earlier has been moved to Haryana. Priyanka Gandhi Writing Book 'Against Outrage' on Her Political Vision, to Release it a Month Before 2019 Lok Sabha Elections: Report. 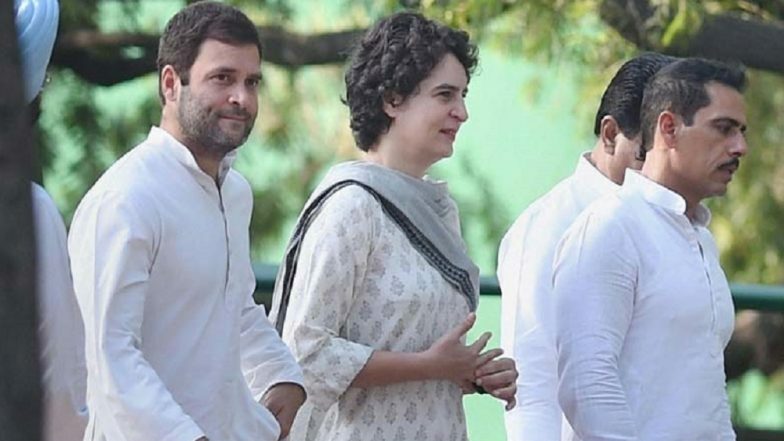 A press release issued by the Congress said that party president "Rahul Gandhi has appointed Priyanka Gandhi Vadra as AICC General Secretary for Uttar Pradesh East. She will be taking charge with effect on first week of February 2019." However, whether she will contest the elections has not been announced by the Congress, yet. Jyotiraditya Scindia has been appointed as Congress General Secretary for Western Uttar Pradesh region. KC Venugopal has been appointed the Congress General Secretary (Organisation). Congress President Rahul Gandhi had earlier hinted about introducing a surprise element in UP before the 2019 general elections. Priyanka Gandhi Vadra, sister of Congress president Rahul Gandhi, has been away from electoral politics so far. Priyanka Gandhi has restricted her political activities to Amethi and Rae Bareli, parliamentary seats held by Rahul Gandhi and her mother Sonia. According to a report, Priyanka has also been working on a book, to be titled 'Against Outrage', outlining her 'political vision'.